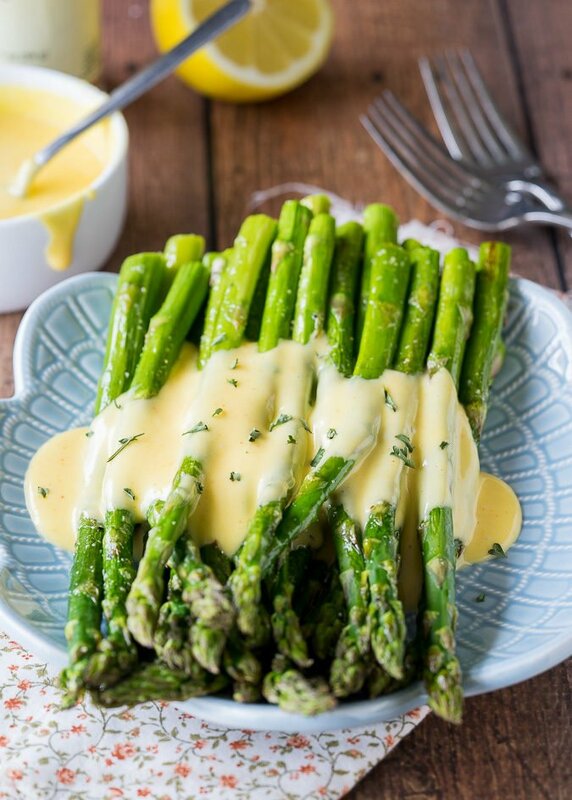 Easy Blender Hollandaise Sauce Roasted Asparagus is a super rich and creamy sauce that goes perfectly with eggs, meats and definitely roasted asparagus. I’m sure you’ve heard of a Hollandaise Sauce, it’s something that I reserve for special occasions, until recently that is. 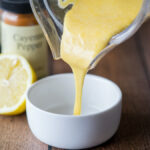 I just found out how to quickly make this deliciously creamy sauce in a blender and it’s quite dangerous. Now I want to drizzle this goodness on top of EVERYTHING! It’s true that Hollandaise Sauce can be quite fatty, so it’s probably not a good idea to actually put it on everything. If you’ve shied away from making this in the past because you thought it would be too difficult, I beg you to take a second look. This sauce is literally ready in one minute, and it couldn’t be easier to make! 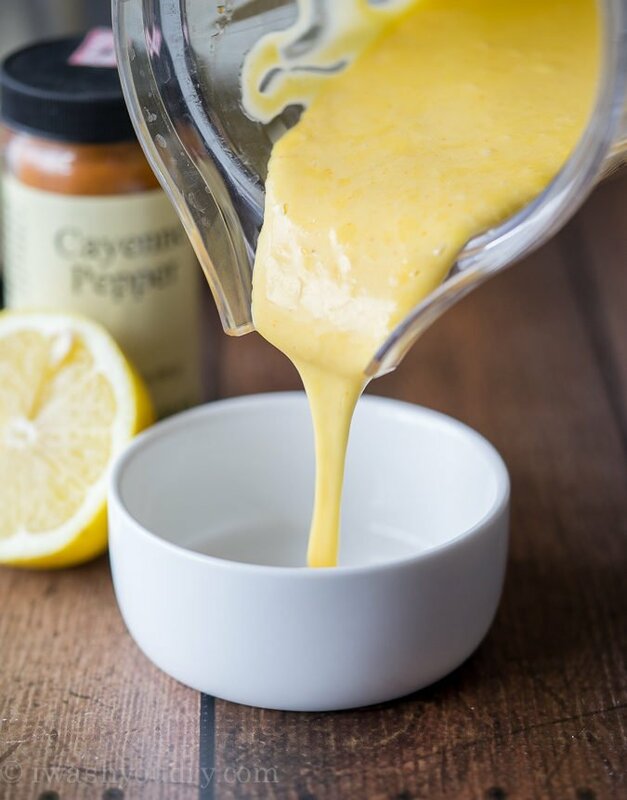 You simply start with egg yolks, lemon juice and a pinch of cayenne pepper in the blender. Give them a few whirls to blend the egg yolks and get some air into them. Then you’ll slowly add in melted butter, while the blender is on low, and the sauce will thicken slightly. Voila! You’re done! This rich and creamy sauce has just a hint of heat from the cayenne and is absolutely perfect when drizzled over some roasted asparagus! 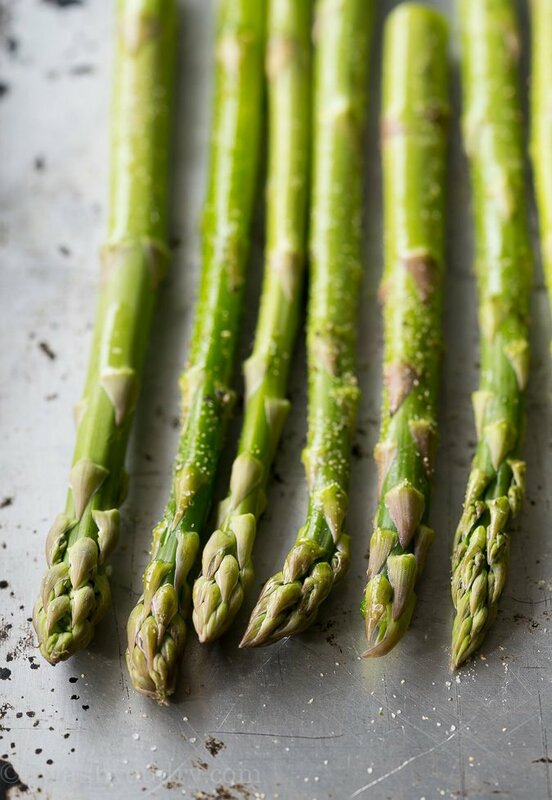 Is there anything more gorgeous than fresh asparagus?! I love this time of year when asparagus is so cheap. We have asparagus at least two or three times a week! 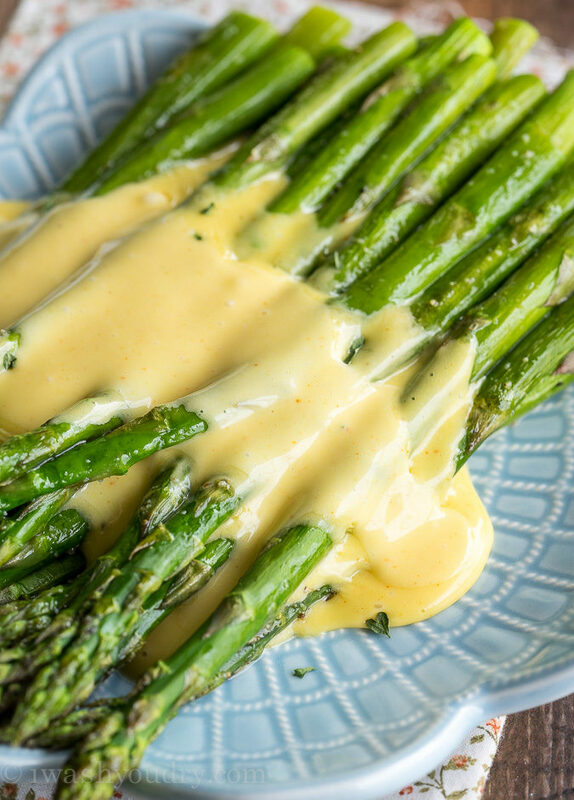 Once your asparagus is roasted (which takes less than 15 minutes), you can drizzle that Hollandaise Sauce right on top. Be warned… this stuff is SO GOOD! You’re going to feel like a true chef with this simple recipe and everyone will be super impressed! Melt the butter in a microwave safe dish or in a saucepan over low heat until melted. Try to not let it boil. 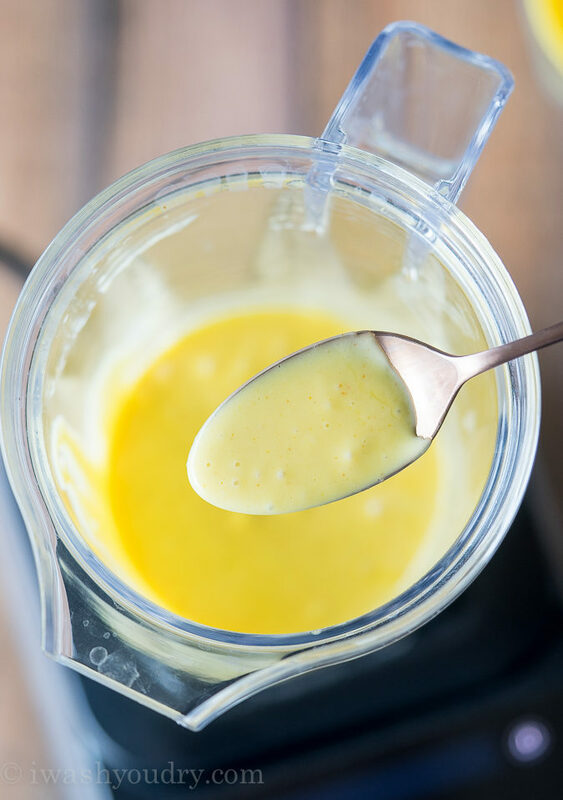 Add the egg yolks, lemon juice and cayenne pepper to the blender and blend for 20 to 30 seconds, until the egg yolks turn a light pale yellow. 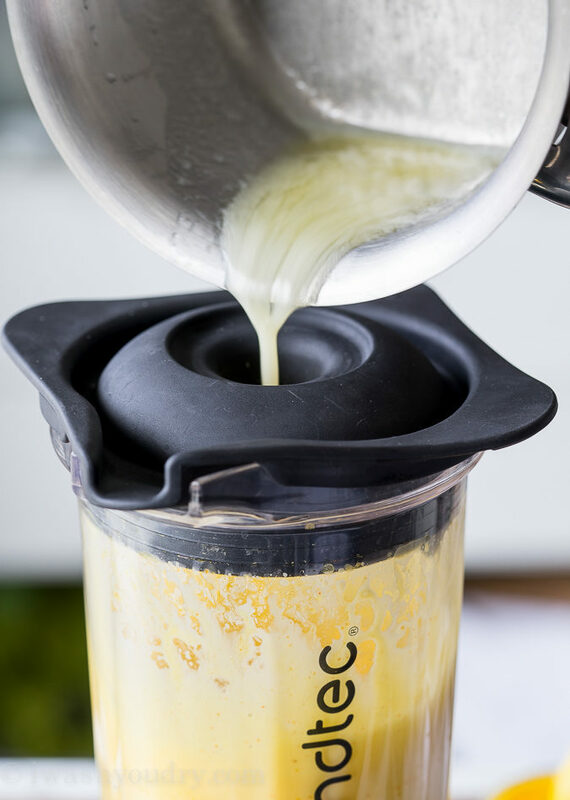 Remove the center of the blender lid and slowly pour in the melted butter, while blending on LOW speed. 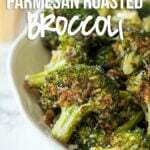 Keep sauce in a warm place and use within 1 hour of making. Enjoy! 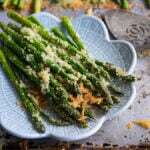 Toss the asparagus with the olive oil and seasonings then spread into an even layer on a baking sheet. Bake for 12 to 15 minutes, until crisp tender. Enjoy! Store in fridge for up to 2 days. Reheat in glass bowl at 20% power for 15 second increments, stirring in between. Repeat until heated through. What about eating uncooked eggs? Hi Lisa, the hot butter will cook the eggs as well as the friction from the blades of the blender. If you’re still concerned though, feel free to use pasteurized eggs. My husband has been making this for years and no one can believe that it is really this simple! I don’t know why more people haven’t caught on to this. It’s definitely delicious, but we try to only use it when we make our Eggs Benedict Brunch which we do with fresh fruit, hash browns and champagne, on a cheat Sunday about once a month. Oh so delicious!! 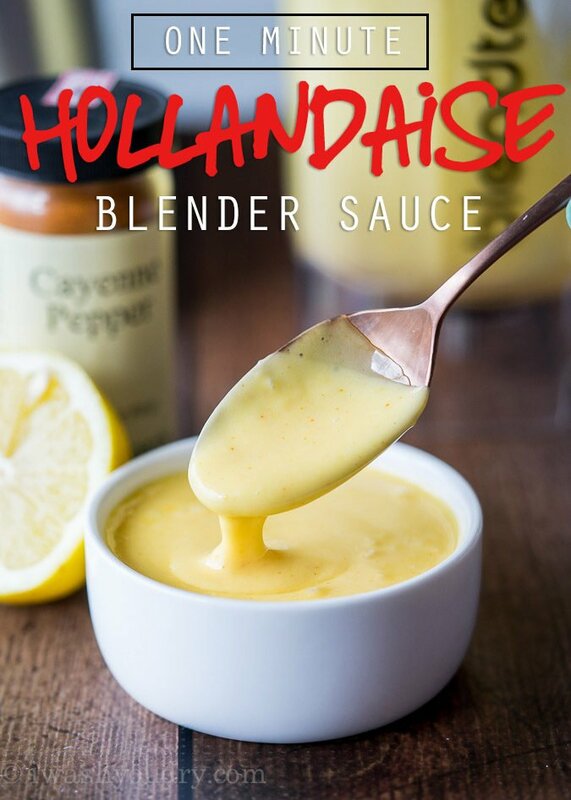 Could this Hollandaise sauce be used for Eggs Benidect as well? Yes!!! It’s so good on eggs! Oh. My. YUM!!!!!! I had no idea I could do this in one minute in my blender – I may be in trouble Shawn!! !